When mitochondria become damaged, they avoid causing further problems by signaling cellular proteins to degrade them. A 'hit-and-run' interaction between two proteins could be an important trigger for cell death, according to new research from Walter and Eliza Hall Institute researchers. A sleepless night not only leaves us fatigued and distracted, it also makes us interpret things more negatively and makes us more likely to lose our temper. Diseases affecting mitochondria, the powerhouses of our cells, are often caused by mutations in the mitochondrial DNA. Symptoms of such mitochondrial diseases in mice can be ameliorated by increasing their levels of mitochondrial DNA, according to a study by researchers at Karolinska Institutet. Researchers from Mount Sinai and IBM have discovered a novel clue in explaining how cancer cells with identical genomes can respond differently to the same therapy. 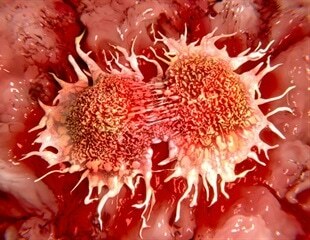 Androgens, commonly known as male hormones, stimulate prostate cancer cells to grow. Thus, many of the drugs to target that cancer focus on stopping androgen biosynthesis or blocking the androgen receptor. This standard treatment is known as androgen deprivation therapy. Using roundworms, one of Earth's simplest animals, Rice University bioscientists have found the first direct link between a diet with too little vitamin B12 and an increased risk of infection by two potentially deadly pathogens.